From the man who has played in more NFL games than any non-kicker in the football league’s history comes a memoir about the Matthews family and how eight people over three generations have achieved success in the NFL—more than any other family in sports history. No family has qualified more of its members for the demands and rewards of the National Football League than the Matthews clan—eight and counting over three generations. They include Bruce’s father Clay, an original NFL San Francisco 49er; his brother Clay Jr., a four-time All-Pro for the Cleveland Browns; and nephew Clay III, a Defensive Player of the Year and Super Bowl champion with the Green Bay Packers. Bruce Matthews may be the best of them all, a fourteen-time Pro Bowler with the Houston Oilers and Tennessee Titans, holder of the all-time consecutive starts record for offensive linemen, and inductee in the NFL Hall of Fame. The enduring success of the Matthews family is no accident. Their competitive nature, passion for excellence, never-quit attitude, compassion for the disadvantaged, and love for each other has propelled them to the peak of their abilities and professions. For Bruce, the foundation of it all is his faith in God. Inside the NFL’s First Family shows how the highs and lows of Bruce’s NFL career and expanding responsibilities as a husband and father taught him the lasting significance of his commitment to Christ. This book is a fascinating peek behind the curtain of professional football, featuring the insider stories that every fan craves. It also shows how Bruce and his family successfully dealt with challenges such as depression, cancer, and Down Syndrome. Yet Inside the NFL’s First Family offers readers even more—the principles and beliefs that have enabled the Matthewses to excel in football and in life. Competition is the spice of sports; but if you make spice the whole meal you’ll be sick. There are many answers to that question. One of them is that we’ve been blessed with good genes and bodies that can take a pounding. But there’s definitely more to it than that. It’s a story that begins more than a century ago, back to at least 1889. That’s when my grandfather, Howard Lynn “Matty” Matthews, was born. He got his start in Jeffersonville, Ohio, but spent most of his life in Charleston, South Carolina. That’s also where he met and married my grandmother, Elsa “Booty” Bargmann. Matty began his athletic career in baseball, playing in the minor leagues from 1911 to 1915, primarily in the South Atlantic or “Sally” League. He never earned a spot on a Major League roster yet he made his mark in other ways. Matty was fast, which led to a position switch from catcher to outfield soon after he reported to his first team in Macon, Georgia. According to a newspaper clipping from those days, the Detroit Tigers and Boston Red Sox were in Macon for an exhibition game that first spring. The best-known name in the big leagues during the early 1900s was Ty Cobb, the “Georgia Peach” and Detroit Tigers outfielder who would become one of the original inductees into the Baseball Hall of Fame. Cobb was famous for his hitting and nasty disposition, but also for his fleet feet. He stole 892 bases during his career, which at the time was the all-time record. A newspaperman came up with the idea of a footrace featuring my grandfather, Cobb, and another player. The contest was a sprint from home plate to first. I can imagine onlookers placing more than a few wagers before those competitors squared off. If they bet on Cobb or the other player, they lost their money. Matty beat them by three yards. Even then, it seems, the Matthews family hated to lose. When America entered World War I, Matty joined the army. They introduced him to the sport of boxing and it grew into one of his life’s passions. In 1926, he joined the staff of the Citadel, the military college in Charleston. He coached boxing, baseball, and track and field there, but it was boxing that built his reputation. He taught the sweet science to Citadel cadets for nearly three decades and coached a number of champions. Just a few years ago I spoke at an event in Charleston. After I was finished, some of the elderly locals spoke to me. They told me about taking boxing lessons from my grandfather, saying he was tough but fair. I thought that was pretty cool. My grandfather passed on his athletic genes to my dad and my dad’s two brothers, but Matty also gave them a major dose of his toughness and will to win. He had all three of his boys boxing before they entered elementary school. Boxing wasn’t my dad’s only sporting interest, however. He went to college at Georgia Tech, joined the wrestling team, and became the Southeastern Amateur Athletic Union heavyweight champ. He was eventually elected to the Georgia Tech Athletic Hall of Fame. He was also a college swimmer and diver. But competing in the ring, on the mat, and in the pool wasn’t enough challenge for my dad. He also decided to test himself on the gridiron. At Charleston High, he went out for the school team and was a standout on the offensive and defensive line. He continued with football in college. Those years were part of a golden age for Georgia Tech football. In 1947, my dad’s first season with the varsity, legendary coach Bobby Dodd was in just his third year with the Yellow Jackets. The team won nine of its first ten games, losing only to Alabama before knocking off Kansas, 20–14, in the Orange Bowl. They were nearly as successful the next two seasons, finishing with a 7–3 record both years. Dad enjoyed plenty of athletic success in college but, in those days, professional sports were not nearly as lucrative as today. They weren’t the answer for most young men who wanted to make a decent living. Dad graduated with a degree in industrial engineering and planned to use it. Then he got a call from a representative of the San Francisco 49ers, a team that had just joined the NFL, saying the draft was over and they wanted him on their team. The league draft wasn’t a media sensation back then. Dad never did hear when he’d been chosen. Many years later, when I was with the Oilers, I was in the training room and picked up a Los Angeles Rams Media Guide. I’d always been interested in the history of the game, so I looked up the Rams’ annual draft results. Suddenly, I saw a familiar name. I was so excited that I called my father that night. Dad obviously wasn’t at the top of the 49ers’ prospect list, yet the chance to compete and test himself against the best was too appealing to pass up. He decided to report to the 49ers for the 1950 season. Dad made the team, earned a salary of about $6,000—decent money back then—and played in all twelve games for San Francisco as a right tackle on offense and a tackle and end on defense. He recovered two fumbles, recorded an interception, and even returned one kickoff. The 49ers wanted him back for 1951, but Dad had a new challenge in mind. By then the United States was involved in the Korean War and Dad wanted to be part of it. He volunteered to become a paratrooper and was sent to Fort Bragg in Fayetteville, North Carolina, for training. The leaders at Fort Bragg pushed their men hard, trying to weed out those who might quit on the battlefield. My dad was one of those who lasted. He eventually made twenty-one jumps as a member of the U.S. Army’s 82nd Airborne Division, though he never saw action in Korea. Dad’s brothers, my uncles, showed the same kind of determination and desire to test themselves. Lynn, his older brother, graduated from the United States Naval Academy and eventually commanded a nuclear submarine. Dale, Dad’s younger brother, became an ace jet pilot in both the Korean and Vietnam wars. Jumping out of airplanes wasn’t the only thing on my dad’s mind at Fort Bragg, though. It was while he was in Fayetteville that he was introduced to a vivacious woman named Daisy Crowson. She was, in my dad’s words, “Gorgeous, blonde, with green eyes and a nice figure. A sweet lady.” They married in 1953. When the U.S. signed the armistice ending the Korean conflict, Dad returned to civilian life and the NFL. After three more years with the 49ers, the team traded him to Philadelphia. By this time my parents had a daughter, Kristy, who was born in 1954, and Clay, who was born in 1956. Dad was already making more money in the off-season than he was as a player. He decided it was time to exchange his uniform for a suit and tie. It was the right decision financially, because he would soon have more mouths to feed. My twin brothers, Brad and Ray, were born in 1959. I joined the Matthews family on August 8, 1961. Little did I know what I was getting into. One of my biggest impressions of my early years, really of my whole childhood, was of packing up and driving to a new home. Part of my dad’s job at the time was shutting down unproductive factories for Scovill Fasteners, a company that’s still around to this day. The result was that we moved a lot. When I was born, we lived in Raleigh, North Carolina. We moved to nearby Clinton when I was one or two, then we were off to Wisconsin, Michigan, and North Carolina again before we moved across the country to Arcadia, California, for my final three years of grade school. All the moving meant I didn’t keep friends for too long. Maybe that’s why our family is so close-knit. We learned to depend on each other because, so often, we were all we had. Not that we sat around complaining about it. We were too busy discovering new ways to compete against each other. That need to test oneself, so important to my father and grandfather, definitely passed on to me and my siblings. Bruz, Brad, Ray, and I played all the usual outdoor sports and relished each battle (Kristy was usually more interested in horses than in messing around with her brothers). We also turned to standards of the day such as electric football or tabletop hockey. We sat on the floor, hunched over, and twisted the rods that controlled those metal hockey players until our backs were sore. But it was great fun. When we got tired of traditional contests, we turned to more creative pursuits. Baseball was one game we decided we could play anywhere. First it was indoors, pitching a Nerf ball against a batter with a rolled-up newspaper. Then it was in the basement, hurling darts at a dart board while a batter wielded a two-by-four—you had a hit if you got the dart to stick in the “bat.” Nobody was maimed, but we did have a few brushback pitches. After we moved to California, our competitions became even more inventive. Bruz and I created a baseball game that we played in our backyard pool. The pitcher floated on the surface, facedown, and dropped or spun the “ball”—a circular steel plug, less than three inches in diameter—toward home plate, which was actually the drain at the bottom of the pool, six feet down. Also at the pool bottom was the batter, who recorded a base hit by getting the plug to rest on the back of his hand. We played that one often. In theory, the pitcher wasn’t supposed to delay in delivering his pitch, because the longer he waited, the less air the batter had, and the more likely he was to fumble his “swing” or make a bad decision. That was the theory, but my memory is that Bruz used that tactic against me often. I don’t remember doing the same back to him, of course. But it’s possible my brother’s memory of those times might be a little different. When I look back on those competitions with my brothers, I wonder how we survived. Part of it was knowing when to stop (or Mom or Dad making us stop). The other part must have been God watching over us. Dangerous or not, I loved every minute of it. Something about contending for a victory, even if the reward was just bragging rights that lasted only until the next game, made me feel alive. I couldn’t get enough of it. Naturally, I loved recess at school. Kickball, softball, punch ball—whatever was going on, I was in the middle of it. My desire to compete usually brought out the best in me, but there have been a few occasions when it got the best of me. One of those times came a few years later, when I was sixteen. I’d never done much boxing. Dad didn’t insist on it the way his father did with him, though Dad did teach me how to throw a jab and protect myself. Then one day I got in the mood to throw a few punches. We started messing around in our driveway. It was supposed to be just a bit of fun, but pretty soon I was peppering Dave in the mouth with jabs. The problem was that Dave wore braces, the old-school kind with lots of metal. Dave started getting ticked off, and with good reason. His mouth was all bloody. My dad happened to come home from work right then. He was not happy about what he saw. I knew I was in trouble. “Dad, I’m sorry,” I said. But it was too late. At that time I was probably six foot three and 225 pounds, the same height as and heavier than my dad. But it didn’t really matter how big I was. I wouldn’t have lasted a single round against him if he’d been trying to knock me out. To his credit, he only wanted to make a point. He hit me with just a couple of jabs and it was like the old Rocky movies, with my head snapping back like a yo-yo on a string. All I could think was, Oh, my gosh, I do not ever want to tangle with my dad. Dad taught me a lesson that day—competition is great, but there’s a line that you don’t cross. To put it another way, be tough but fair. Despite that driveway confrontation with my dad, my desire to compete and win actually intensified as I got older. It always showed up during my continuing competitions with Bruz. When I was at the University of Southern California, he and his family lived near the campus. During his off-season, I would drive over and we might start with a fierce Ping-Pong war. Then we’d sit on his couch and play video games on one of the old Intellivision consoles. There was plenty of taunting and smack talk, including at least a few imitations of the Jets’ Mark Gastineau doing a sack dance. Those battles could go for hours, until two, three, or four in the morning—however long it took for me to win. I certainly drew on my competitive nature while playing football for USC and when I reached the NFL. It was a major motivating factor in my drive to excel and defeat my opponent whenever I stepped onto the field. Yet the most fun I had competing continued to be the games and battles of skill and wills with Bruz. That was probably because we learned where to draw the line with each other. I still remember the day we figured it out. It was May 1983. I was about to graduate from college and start my pro football career, while Bruz was already a five-year NFL veteran. Our family had gathered for a picnic at a friend’s backyard in California’s High Desert. Either Bruz or I spotted a couple pairs of boxing gloves lying in the grass, so of course we had to put them on. We were just joking around, flicking little jabs at each other, when—at least as I remember it—Bruz suddenly popped me. I don’t mean a knockout punch or anything like that, but enough that it stung a bit and upped the ante. Naturally, the competitor in me had to respond. I jabbed him back, this time a little harder. The next punch from Bruz came back harder still. Pretty soon we were in a clinch that for a moment felt more like a stand-up wrestling match. Then the lightbulb went on for both of us and we separated. I had a scratch from my temple down to my cheek. We were fortunate that neither of us suffered anything worse. I was embarrassed that we’d let things get out of hand. I’m sure Bruz felt the same way. From that point on, Bruz and I dialed our battles down a notch. For one thing, the stakes were higher—an injury could have put either of our careers in jeopardy. But more than that, speaking at least for myself, I didn’t want my intense desire to win to somehow create tension or put any distance between us as brothers. We still did and do love to challenge each other, but now it’s more about the joy of competing and being together than the need to score a victory. For example, a few years after I got to the NFL, we started a weekly “sports day” during our off-season. This consisted of getting up at five in the morning, joining our buddy, Bob Queen, at Denny’s for a Grand Slam breakfast, and proceeding in the predawn darkness to a public golf course. Golf was so popular in Southern California that it was next to impossible to secure a tee time, so we got a jump on the crowd. When the first rays of sunlight crept over the hills, we were already at the first tee, ready with our drivers. We had the course to ourselves, as it wouldn’t open for another half hour. Our matches on the links were pretty even though none of us was a stellar player. After eighteen holes, we’d head over to a bowling alley for five or ten games. I have to admit that Bob usually won those contests. That took most of the afternoon, but Bruz and I both played on city league softball teams, so we always had a game or two in the evening. In later years, we added tennis to the equation. You’ve probably got the idea by now—I truly love competing, and Bruz is my favorite opponent. But it’s taken me quite a few years to put that insatiable desire to win in its proper place. In college and later in the NFL, my competitive spirit was a huge source of strength. Sometimes, though, it was also a weakness. Once in a while I found myself saying or doing something I wasn’t proud of—cussing out a referee or losing my temper and making an unnecessarily vicious block. You might be reading this and thinking about your own competitive nature. Believe me, I’m not suggesting that you should be ashamed of it or give it up. I just believe that when it crops up, it needs to be managed. As I look back on my football career today, I remember players who possessed that healthy, competitive drive. You could see why they were a notch above others, why they stood out. They demonstrated it was possible to be a great player without being a jerk. I feel that I also got there, eventually. It just took me a little longer than I’d like to admit. Today, I’m grateful that my temperament includes that inner fire. It’s an important part of who I am. But I’m also thankful that, though I still slip up on occasion, I’ve learned how to channel it in healthy ways. It’s better for me and for the people around me. Even Bruz might agree with that. 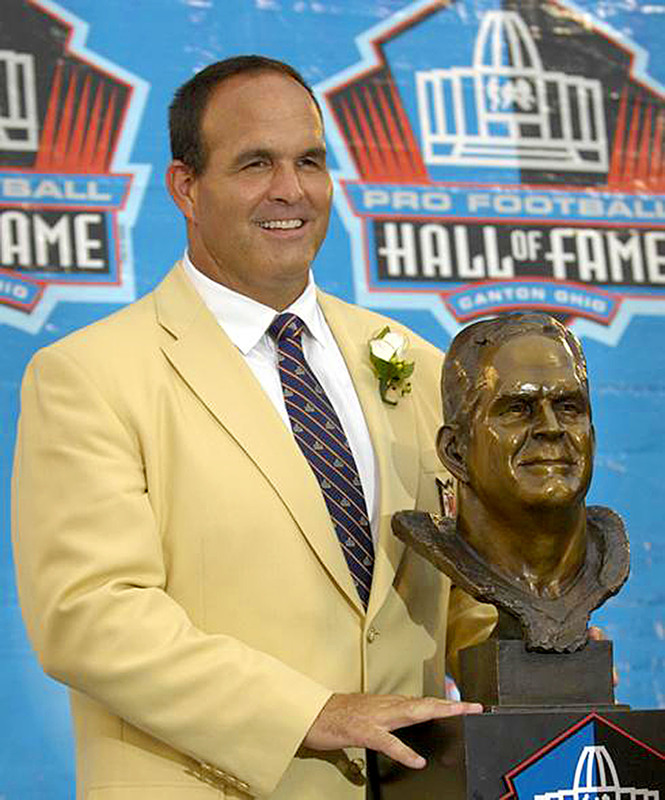 Bruce Matthews is a fourteen-time Pro Bowler, holder of the all-time consecutive starts record for offensive linemen, and inductee in the NFL Hall of Fame. He was named to the NFL Pro Football Hall of Fame All-Time Team. Following his retirement, Matthews began hosting golf tournaments for the Greater Houston Fellowship of Christian Athletes and the Texas Special Olympics. He lives in Sugar Land, Texas, with his wife, Carrie, and their seven children. He is the author of Inside the NFL’s First Family. “The Matthews are the First Family of Football and Bruce is their Patriarch, one of just over 300 to have a bronzed bust in Canton, Ohio as the greatest of all time. All of us can learn from his faithful journey of commitment, character, courage and compassion—what it takes to have a Hall of Fame family and Hall of Fame life”. “In my twenty-three years of coaching in the NFL, Bruce Matthews was one of the most competitive, yet humble teammates I ever had the privilege to coach. He was a warrior in the trenches on the gridiron and has always been a warrior for Christ. Join him in his family journey as he takes you inside the locker room and the life of a Hall of Fame player. “Button your chin straps!” . . . You’re going to love this! “While reading this book I could feel Bruce’s spirit and energy, which is raw and inspirational. Bruce embodies all of the qualities of what and who a man is. His strong core values and beliefs jump off of each page. Those same qualities permeated in our locker room where Bruce was a wise, loving, faith-filled, persistent and tenacious “granddaddy” role model. I knew without a doubt for seven of my eight years as an Oiler/Titan, I could always count on Bruce Matthews to be there, no matter what, even when injured. And I’m extremely grateful." "Bruce Matthews is a winner as an NFL player, a husband, a father, and a man of God. His new book, which tells the amazing story of the Matthews family, is a winner too. If you’re looking for inspiration to be better in every aspect of your life, you need to read Inside the NFL’s First Family." 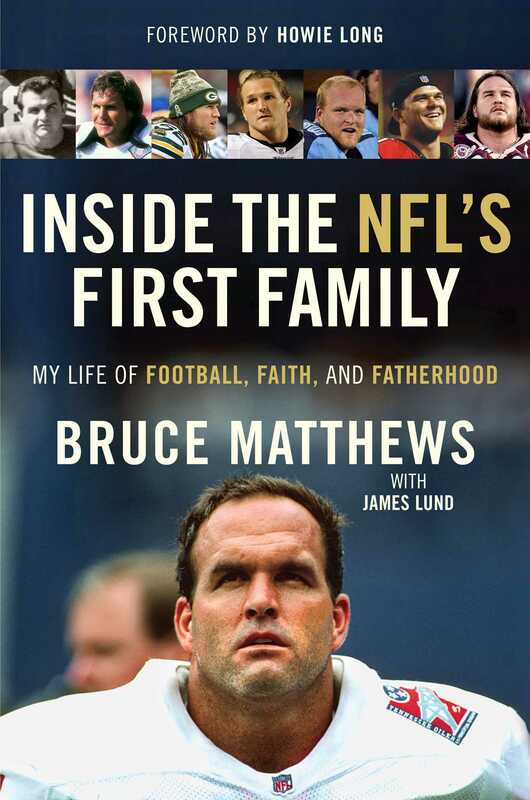 Inside the NFL’s First Family provides extraordinary insight into Bruce Matthews’ journey from childhood to the Pro Football Hall of Fame. The Matthews family has embodied greatness on the field for three generations. “First Family” shows what an important role their faith in God has played in helping them become leaders and role models who set a standard that transcends the sport that has made them so successful.